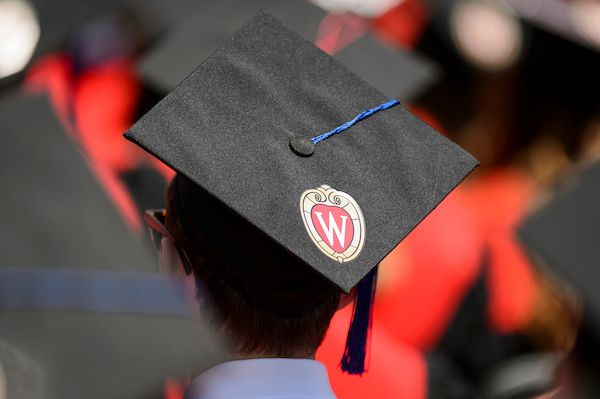 This webpage describes steps to completing a master’s degree at UW-Madison. Not all programs require a master’s thesis, but if yours does, the steps for depositing the thesis are described toward the bottom of this webpage. LOOKING FOR Doctoral DEGREE REQUIREMENTS? Click here for steps to completing your doctoral degree degree. Graduate registration for a minimum of two graduate-level credits (300-level or above for a grade, no audits, or pass/fail) in the semester (fall, spring or summer) you expect your degree. Alternatively, if a degree completion fee has been approved by the Graduate School, you must have paid the fee in lieu of registration (see the Academic Guidelines: degree completion fee). Credit requirement for the appropriate degree has been met, or will be by the end of the semester (master’s degrees, 30 credits including 16 residence credits; MFA and Specialists 42 credits including 24 residence credits). Graduate GPA of at least 3.00. All incomplete, unreported grades, or progress grades in anything other than research/thesis (usually 690, 790, 990) must have been cleared. Independent study (usually 699, 799, or 999) must be given a grade (not progress) each semester. If you are continuing for a PhD, a warrant may be issued even though you have incomplete or progress grades that are part of your PhD program, but your advisor needs to send a letter to the Graduate School stating which courses are for your PhD requirements. Students receiving a second (or third) master’s degree from UW-Madison, and students receiving two master’s degrees during the same semester, must submit official lists (on program letterhead and signed by advisors or program chairs) of courses used for each degree. We use these lists to check the 25% overlap rule. You must complete all requirements by the appropriate degree deadline. Please complete the Master’s Degree Survey to inform the Graduate School about your academic experience and career plans. By completing the survey, you provide the Graduate School with valuable information about post-degree placement, and help us determine how we can improve programs and services for students. All answers are kept confidential and are only shared in aggregate with all of the other responses from your program. The survey takes about 20 minutes to complete. At the end of the semester, graduate students will be sent an email containing a link to the survey. If you are required to deposit your thesis at Memorial Library, you must deposit before the degree deadline. Please follow the instructions available at toward the bottom of this webpage. A warrant is a document issued to your program by the Graduate School at your program’s request after you have met all degree requirements. Warrants are valid for one semester, and are signed by the program chair, advisor, or your committee. By signing the warrant, programs indicate that all program degree requirements have been met. If the Graduate School does not have your warrant with appropriate signature(s), you will not graduate. NOTE: If your program has signed and returned your warrant to the Graduate School, and you receive an Incomplete or Progress grade at the end of the semester, or you deposit your thesis after the degree deadline, you will receive your degree during the following semester when your grade is cleared or your thesis is deposited (if your program requires thesis deposit). The amount of this fee is equal to two credits at the in-state rate. The Graduate School must approve payment of the fee in lieu of registration. If the fee is appropriate for you, your program must submit a Degree Completion Fee Request Form to the Graduate School for approval. To qualify you must be finished with all degree requirements except for a thesis defense, comprehensive exam, presentation of a final project, or an incomplete course. You must have submitted your thesis, paper, or project to your advisor while you were registered in the previous semester. Before your degree is posted on your final transcript and diploma is available, you can request a Degree Completion Letter from the Registrar about two weeks after the end of the session (or sooner if you complete early in the semester and all requirements are cleared). Contact Office of the Registrar at 333 East Campus Mall #10101. This is the time between the end of one degree period and the beginning of the next. If you were registered for the previous semester and met all degree requirements by the end of the window period, your degree will be granted in the following semester, but you will not have to register or pay fees for the next semester. If you want your name to be printed in the commencement program, you must submit an Apply to Graduate application through your MyUW Student Center. This is in addition to contacting your program to request your degree warrant from the Graduate School. You may attend the ceremony even if your name is not included in the commencement program. There is no commencement ceremony in August. If you plan to graduate in August, you may attend either the May or the December ceremony by submitting the Apply to Graduate application through MyUW Student Center. Cap and gown rentals are available at University Bookstore. Guests can attend without tickets. The Registrar’s Office handles Degree Completion Letters. If you have completed all degree requirements (including the deposit of your thesis in Memorial Library if it is required) and are waiting until the next degree conferral date to receive your degree, you may request and receive a letter indicating that all requirements have been completed. All grades from the semester in which you are graduating must be posted on your record before you can receive a completion letter. The Registrar’s Office will send your diploma to your DIPLOMA address approximately 8 weeks after degree conferral. Update your Diploma address via the MyUW Student Center prior to leaving campus. International students MUST enter the DIPLOMA address via the MyUW Student Center to receive your diploma. Students with holds will not receive their diploma until those holds are cleared. The Registrar’s Office posts degrees on official transcripts approximately 4-6 weeks after the end of the semester. You can order your official transcripts online. For more information, contact your graduate program coordinator or the appropriate resource listed below. These guidelines should help you prepare your thesis, so that it will constitute a permanent document of quality appropriate for a major graduate institution. Not all departments require that your thesis be deposited in Memorial Library. If your department has this requirement, your thesis should conform to the standards. It must be approved by the faculty committee, be unbound, fully corrected, and complete. You may choose to deposit your thesis in Memorial Library even if your department does not require it. Once your thesis is deposited in the library, you are not allowed to make changes on the final copy. Careful review of the final copy before you bring it to the library can prevent delays, and avoid the difficulties of correcting errors discovered later. Please make all personal or departmental copies before submitting the thesis to the library. You are responsible for knowing the appropriate deadlines for degree completion, listed at the bottom of this webpage. Most master’s theses at UW – Madison are not microfilmed. If you choose to publish your thesis through UMI, you need to talk to the Graduate School Degree Coordinator, Room 217 Bascom Hall, in order to file the appropriate paperwork. UMI works with Memorial Library to publish thesis abstracts and, upon request, to provide microfilm and photocopies of theses to the public. Check with your department whether you must deposit a thesis. You do not need to bring your thesis to the Graduate School for approval unless you choose to microfilm your thesis through UMI. You or your designate must bring your unbound thesis to the Memorial Library Binding Unit, Room B137. The library does not accept theses by mail. Please bring your student I.D. number. Make sure you have included the Advisor Approval Page (see formatting requirements, below). The Library will notify the Graduate School of deposit. The library cannot accept your thesis without this page containing your advisor’s original signature. Faxed or photocopied page is unacceptable. Some departments use a standard form for this page. You may substitute a single sheet that contains the word APPROVED, followed by your advisor’s signature, advisor’s title, and date signed. This page is not numbered, or counted in the pagination. This page must not be double-sided with the title page or any other page. Check with your department to determine what style is preferred. Here is a list of the major style manuals recommended by the American Library Association, and commonly used by writers in the disciplines noted. These books are available at bookstores, and in the General Reference Room at the Memorial Library. The Writing Lab in 6171 Helen C. White can also help you prepare your thesis as well as recommend reference manuals. MLA Handbook for Writers of Research Papers. 3d. ed. By Joseph Gibaldi and Walters S. Achtert. Modern Language Association, 1968. A style manual for the humanities. Publication Manual of the American Psychological Association. 4th ed. American Psychological Assoc., 1994. Widely used as a reference for psychology, education, and other social science disciplines. CBE Style Manual. 5th ed. By the Council of Biology Educators, Committee on Form and Style. American Institute of Biological Sciences, 1983. The standard reference source for life sciences (biology, chemistry, biochemistry, geography, and geology). The Chicago Manual of Style. 14th ed. Univ. of Chicago, 1993. A comprehensive standard reference. A Manual for Writers of Term Papers, Theses, and Dissertations. 5th ed. theses, and is more affordable than Chicago Manual of Style. Your department may require an abstract to be included within the thesis. Please follow your department’s style requirements, and number these pages as part of the preliminary material. Unusual or supplementary materials, such as questionnaires or copies of photographs, may be put into appendices. The appendices must be consecutively paginated with the text. The paper quality and margins of the appendices must conform to the standards for the rest of the thesis. The bibliography should meet your major department’s style requirements, which often conform to the leading journals or book series of the field. You may register a copyright of your thesis by writing to: Register of Copyrights, Library of Congress, Washington, D.C. 20559. You can find more information at the U.S. Copyright Office website. To ensure a clean final copy, correct and reprint pages. Do not make handwritten corrections or use correction fluid in the final copy. Double-sided print is acceptable. But the Title Page and the Advisor Approval Page must not be double-sided. We suggest that you set both right and left margins at 1 1/4 inches. Remember to place page numbers in the upper left-hand corner for the back side of the page. Superscripts and subscripts may be one size smaller than the text. Separate equations with double spacing or enough space to identify each equation clearly. Footnotes and end-notes may be single-spaced with an extra space between notes. Footnotes for each chapter are usually numbered consecutively. Follow the preferences of your major department when deciding the location of footnotes or end-notes: at the bottom of the page, grouped at the ends of chapters, or grouped at the end of the thesis. You may include quotations in languages other than English in your thesis However, the thesis must be in English unless your department certifies that one or both of the following conditions have been met: the foreign language is that of the readers to whom the work is addressed; or translation into English would make the study obscure and imprecise. Theses submitted by students from a foreign language department are acceptable in the language of that department. Computer-generated figures and graphs must meet the same standards as the rest of the thesis. Render original material with a permanent, non-water soluble, black ink (e.g. India ink, Koh-i-noor rapidograph drawing ink, etc.) Do not use pencil, ballpoint or felt tip in the final copy. Labels on photographs, charts, and other figures must be permanent. Headings, keys, and all other identifying information should be of the same quality of type as the text. If graphics, tables, or figures are horizontal, place the top of the printed page on the left side of the paper with the page number in the upper right hand corner. The text begins 1 – 1/4 inches from the top and left side of the paper. Bottom and right side margins are 1 inch. Page numbers are placed in the upper right-hand corner 1 inch from both sides of the paper. 8 -1/2 by 11 inches. You can buy paper that meets these requirements at book and stationery stores. Black print with a sharp, dark image. 12 or 14 point type. Double-space the body of the thesis. Lengthy quotations, footnotes, and bibliographies may be single -spaced. Color maps, charts, etc. are acceptable. Please do not use page headers or decorative borders. Please check your thesis to ensure that all pages are present and in numerical order. The library cannot check your thesis for the page order, and will bind the thesis in the order you present it. All pages must be numbered with the exception of the title page and advisor approval page. Preliminary pages (e.g. table of contents, dedication page, acknowledgments, abstract, etc.) that precede the main text are numbered with lower case Roman numerals beginning with numeral i. Page numbers are placed in the upper right-hand corner one inch from both sides of the paper. The main text is numbered consecutively beginning with Arabic numeral 1, in the upper right-hand corner one inch from both sides of the paper. You are responsible for appropriate use of copyrighted materials in your thesis. Some material may be available for use without restriction while other material may require written permission from the rights holder. Other material may be appropriately used without written permission under the “fair use” provisions of the copyright law. General guidance regarding use of copyrighted materials is available from ProQuest/ UMI or from the UW-Madison Libraries website. Fair Use: General information regarding how to determine if your use of copyrighted materials constitutes fair use can be found here. Reviewing and completing a fair use evaluation may also assist you. See the fair use evaluator here. Additionally, your own professional or disciplinary societies may have fair use statements to help you negotiate disciplinary specialties. Written Permission: If written permission is required, you are responsible for obtaining such permission and maintaining records of the written permission to use the copyrighted material in your thesis. You can usually get permission by sending a letter of request to the copyright holder. Normally, your letter will be returned with an approval stamp or signature. Some copyright holders require a specific form of acknowledgment. Note that obtaining written permission can be a lengthy process. Plan ahead and budget ample time to obtain all required permissions. You can scan photographs, tables, and graphs onto thesis quality paper. Alternatively, use a cold mount permanent adhesive sheet, or a dry-mount tissue that requires heat. These mounting products are available at most bookstores, photo supply stores, or art supply stores. We suggest that when you use one of these mounting methods, you have page numbers and identification of figures already on the thesis quality paper. Rubber cement, spray glues, tapes, and glue sticks are not suitable for archival purposes. Please follow the format of this sample page.